This research spotlights ITSM team centricity in everything from IT asset management and enterprise process automation, to increasing support for agile and DevOps initiatives, integrated IT operations, and being a center for IT governance overall. 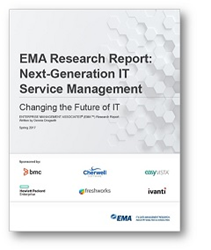 Enterprise Management Associates (EMA™), a leading IT and data management research and consulting firm, has released a new research report titled “Next-Generation IT Service Management: Changing the Future of IT,” based on criteria defined by Dennis Drogseth, vice president of research at EMA. While IT service management (ITSM) has too often been viewed by the industry as an area of reactive management with fading process efficiencies and legacy concerns, this new study reveals that, in many organizations, ITSM is becoming a hub of innovation. ITSM is shown to unify IT across its many silos, promote and measure IT operational efficiencies, and consolidate insights critical for IT-to-business planning. This evolution, however, is not without its obstacles and challenges, nor is it taking place in all IT organizations. In this report, ITSM is examined from various perspectives, including organizational role of respondents, company size and vertical, geographical differences, and success-related patterns of behavior. Targeted at IT executives and technical adopters across not only ITSM teams but also operations, development and IT asset management (ITAM) teams, this report shows what is really occurring with ITSM initiatives in both North America and Europe and provides a blueprint for how best to accelerate forward into a next-generation status. Most respondents (89%) came from central IT ITSM versus line of business (LOB)–centric ITSM. ITSM teams were evenly divided between those with a single service desk and those with multiple service desks. 83% of organizations were managing ITSM and customer service desks as a single group. Only 31% of respondents indicated using ITIL, but of those, the majority saw it as growing in importance. A detailed analysis of the research findings are available in the report, "Next-Generation IT Service Management: Changing the Future of IT." Key highlights from the research are available in the “Next-Generation IT Service Management: Changing the Future of IT” webinar. Founded in 1996, EMA is a leading industry analyst firm that provides deep insight across the full spectrum of IT and data management technologies. EMA analysts leverage a unique combination of practical experience, insight into industry best practices, and in-depth knowledge of current and planned vendor solutions to help its clients achieve their goals. Learn more about EMA research, analysis, and consulting services for enterprise line of business users, IT professionals, and IT vendors at http://www.enterprisemanagement.com or blogs.enterprisemanagement.com.